Claude Monet designed his water garden from scratch, turning a marshland into a beautiful waterscape to paint. His eye as a painter can be noticed in the much thought of composition of the garden. Every where perspectives draw the sight, offering a ready made composition to the artist. Claude Monet planted a beautiful bamboo grove in his water garden at Giverny. Bamboos are ever green. This picture was taken on the 1st of November, the very last day of the season, and even on such a late date bamboos were as pretty as ever. Bamboos are not native to France. 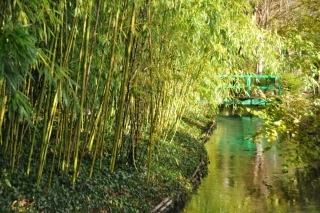 The golden bamboos that Monet chose look very tall and exotic in Normandy. Monet liked growing giant plants and Japanese plants, and bamboos were both at the same time. As a clever gardener, the painter chose the best location for them: on an island of his water garden, where they would get enough water, and where the invasive roots would be contained by the stream. He never painted them, but certainly liked the contrast their shade produces with the pond, that is open and full of light. After Monet passed away, the garden was left without much tending for long years. But the bamboos have survived, because they regenerate spontaneously, making new shoots every year. During the decades when Monet’s house was left uninhabited, the garden became the playground of the children of Giverny. One of their favorite games was playing Tarzan in Monet’s bamboo grove. For them, it looked like a rain forest. 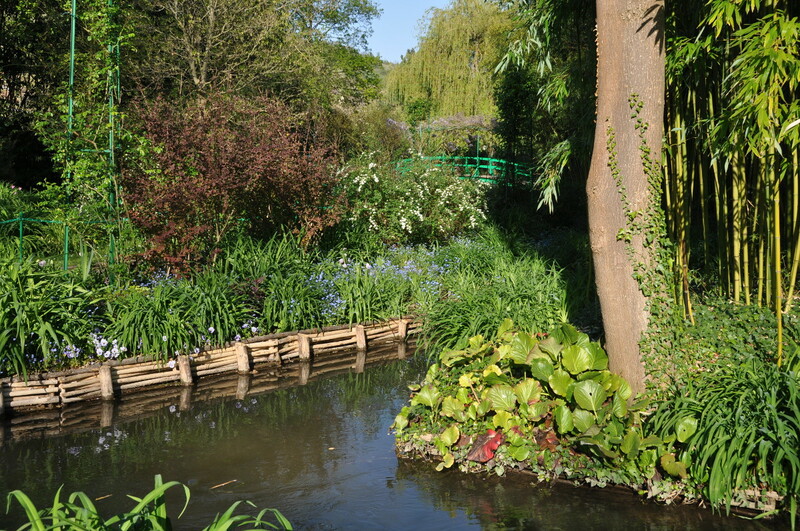 This part of Monet’s water garden at Giverny ‘looks like Japan’, as the painter would have said. Monet was inspired by his large collection of Japanese woodblocks when he landscaped his water garden. 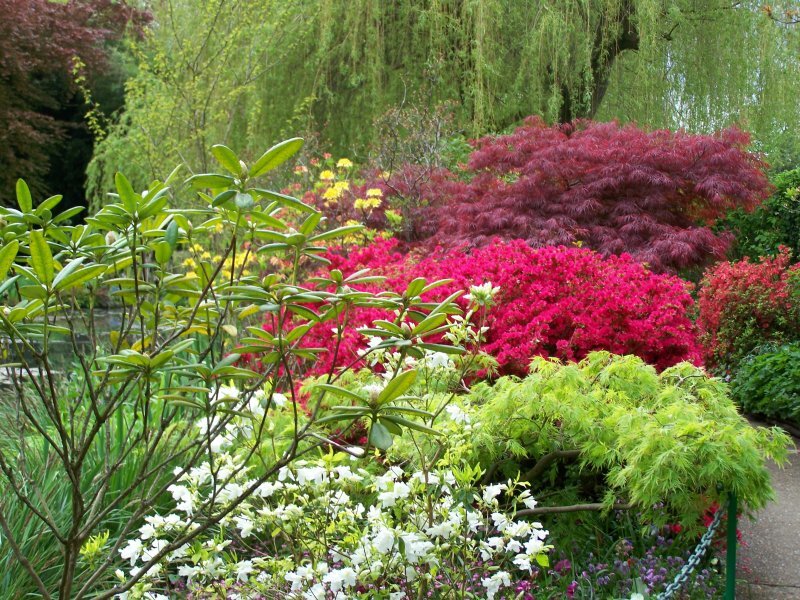 He planted many exotic species of plants he could see on the prints, like azaleas, rhododendrums, wisterias, bamboos, Japanese maples and of course water lilies. Monet imported peonies in trees from Japan. Many plants in his garden had never been seen before in Giverny. However his garden is not a true Japanese garden, the spirit being very different.